Consider the imagery above: The Night Fog Brightness Temperature Difference (10.3 µm – 3.9 µm) product can be used to highlight regions of low clouds (cloud made up of water droplets) because those water droplets do not emit 3.9 µm radiation as a blackbody (but do emit 10.3 µm radiation nearly as a blackbody), and the conversion of sensed radiance to brightness temperature assumes blackbody emissions. Thus, the 10.3 µm brightness temperature is warmer than at 3.9 µm. 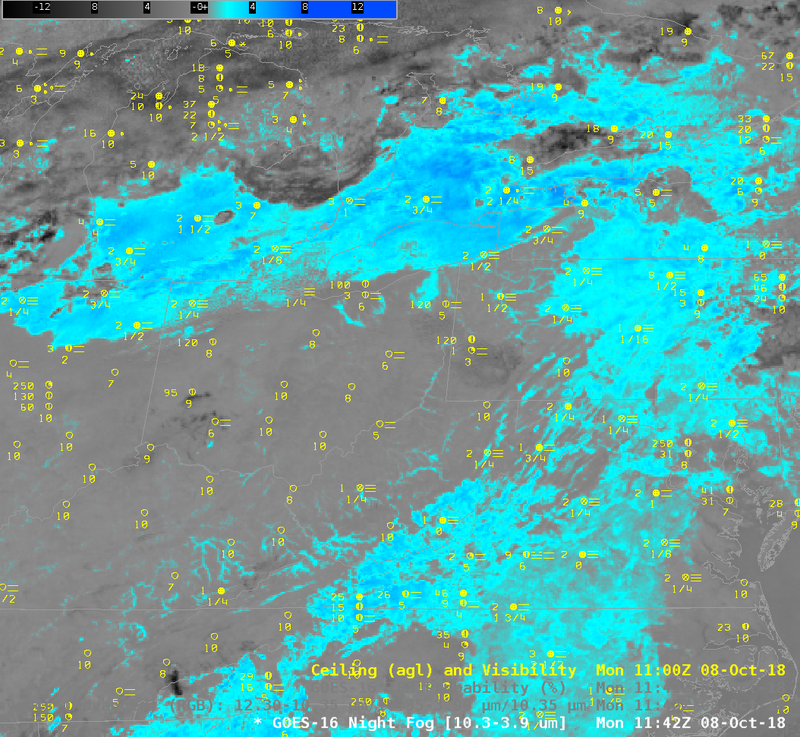 In the enhancement used, low stratus clouds are shades of cyan. 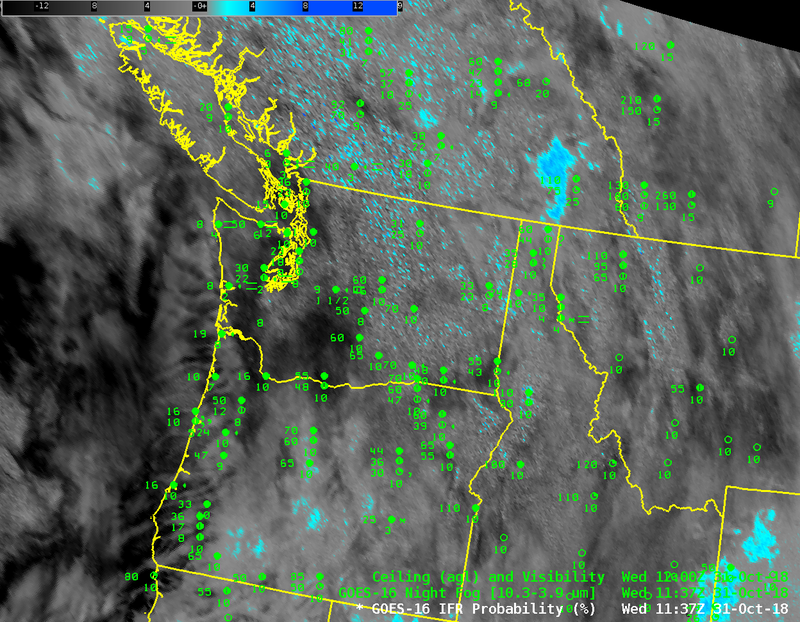 Is there fog/low stratus along the coast of the Pacific Northwest? How far inland does it penetrate. 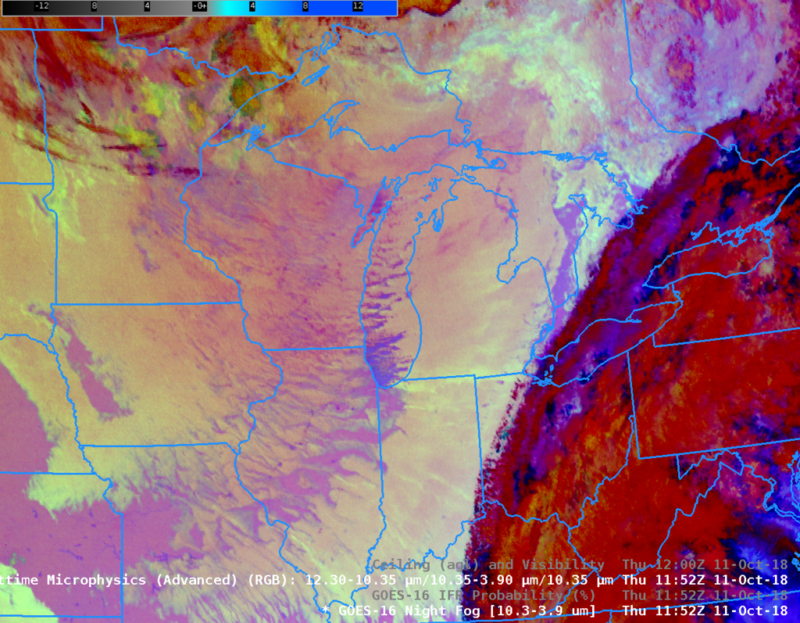 It is impossible in this case (and many similar cases) to tell from satellite imagery alone because multiple cloud layers associated with a storm moving onshore prevent the satellite from seeing low clouds. 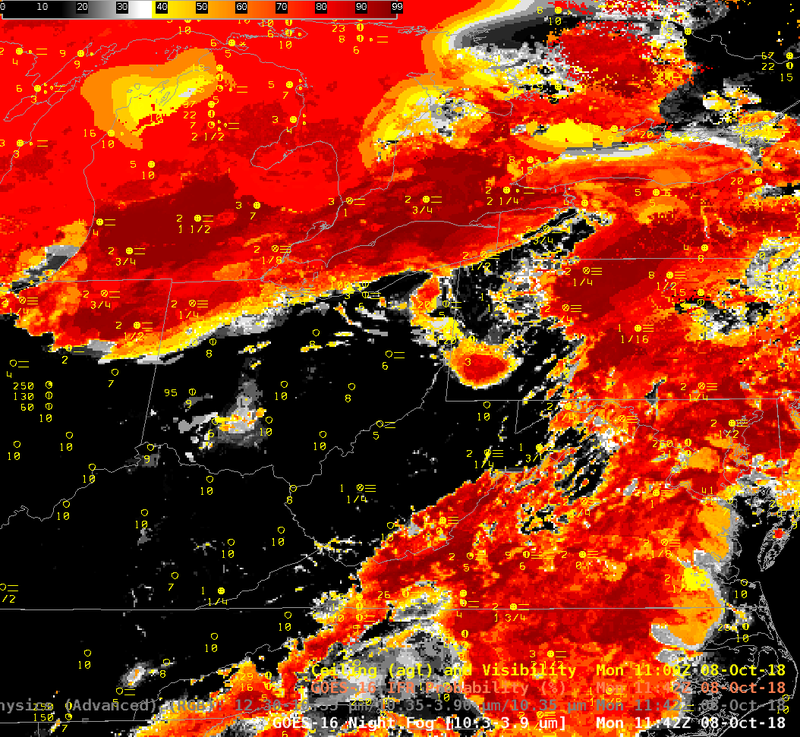 The animation shows the Brightness Temperature Difference field along with surface reports of visibility and ceilings. IFR and near-IFR conditions are widespread, but there is little correlation between their location and the satellite-only signal. 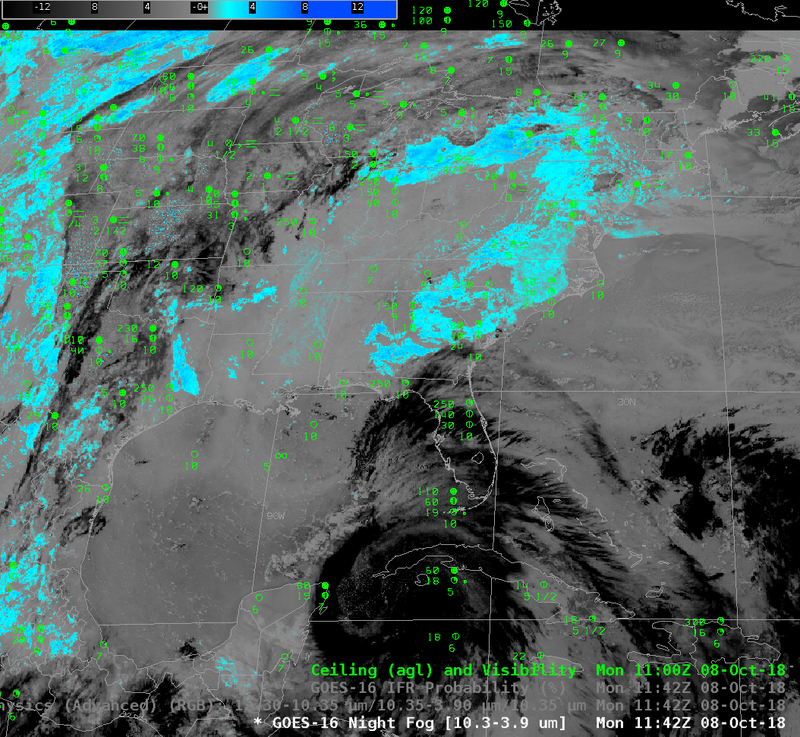 GOES-R IFR Probability fields fuse together satellite information and model data to provide a better estimate of where IFR conditions might be occurring. 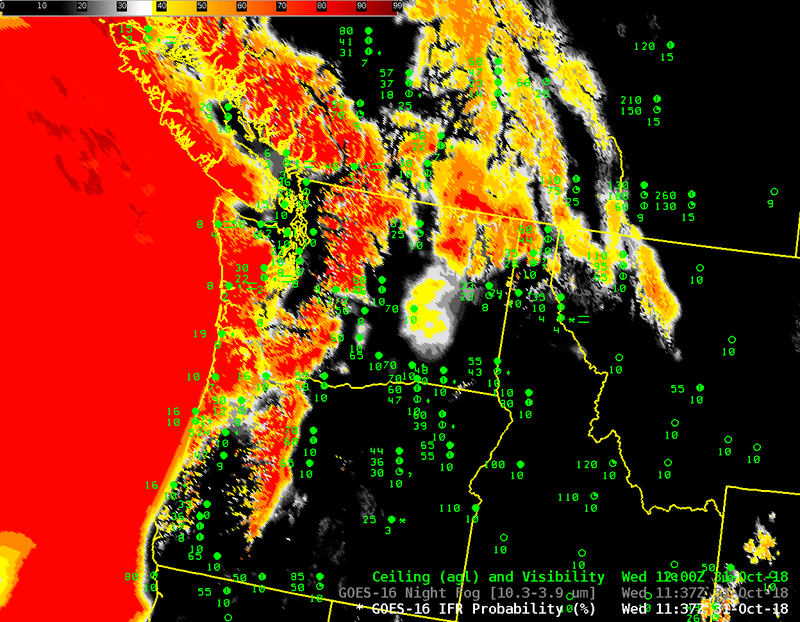 The animation below, for the same times as above, shows a high likelihood of IFR conditions (as observed) over much of the eastern third of Washington State. 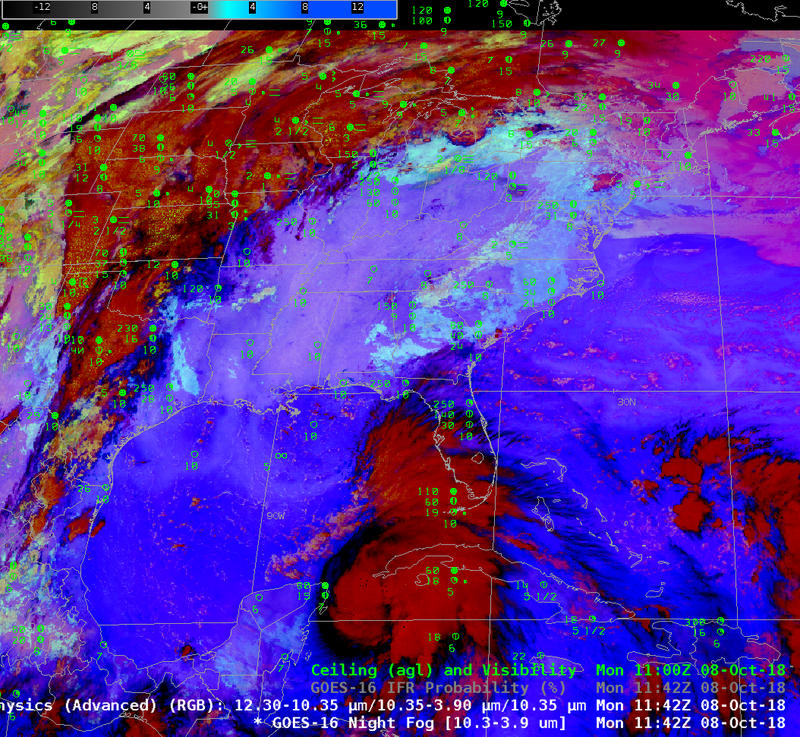 The satellite doesn’t give information about the near-surface conditions in this case, but the Rapid Refresh data strongly suggests low-level saturation, so IFR probabilities are high. The field also correctly shows small likelihood of IFR probailities over coastal southern Oregon and northern California. The Rapid Refresh data used have 13-km resolution, however; fog at scales smaller than that may be present — in small valleys for example. This entry was posted in Multiple Cloud Layers, Pacific Northwest on October 31, 2018 by Scott Lindstrom. Consider the Night Fog Brightness Temperature Difference product, above. The enhancement is such that blue regions show where 10.3 µm brightness temperatures are warmer than brightness temperatures at 3.9 µm. At night, this occurs because cloud water droplets do not emit as much 3.9 µm radiation as a blackbody; the conversion of the sensed radiation to a brightness temperature assumes blackbody emissions have occurred, however, and as a result, the 3.9 µm brightness temperature is cool. Cloud water droplets do emit as a blackbody at 10.3 µm, so the brightness temperature over cloud water droplets is warmer than the it is at 3.9 µm. 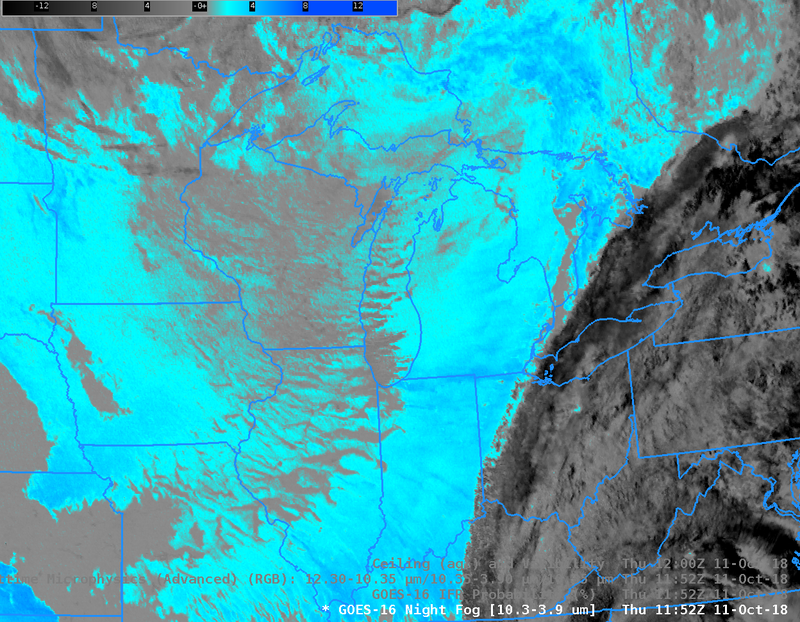 Blue, then, signifies stratus clouds in this enhancement. Can you tell where the fog is? Do you think IFR conditions are occurring wherever the Brightness Temperature Difference field is blue? How about under the extensive cirrus shield, associated with former Hurricane Michael, that is over the southeastern fifth of the image? The Advanced NIght time Microphysics RGB for the same time, below, uses as one of its inputs (the ‘green channel’ in the RGB) the Night Fog Brightness Temperature Difference (Click here for a toggle between the two to reinforce that statement). GOES-R IFR Probability fields, below, for the same time are useful because Rapid Refresh model data used in IFR Probability include low-level model estimates of saturation. If saturation does not exist underneath the cloud deck, then IFR Probabilities are suppressed. Don’t expect fog, then, underneath the strong signal in the Brightness Temperature Difference field over most of the Midwestern United States! 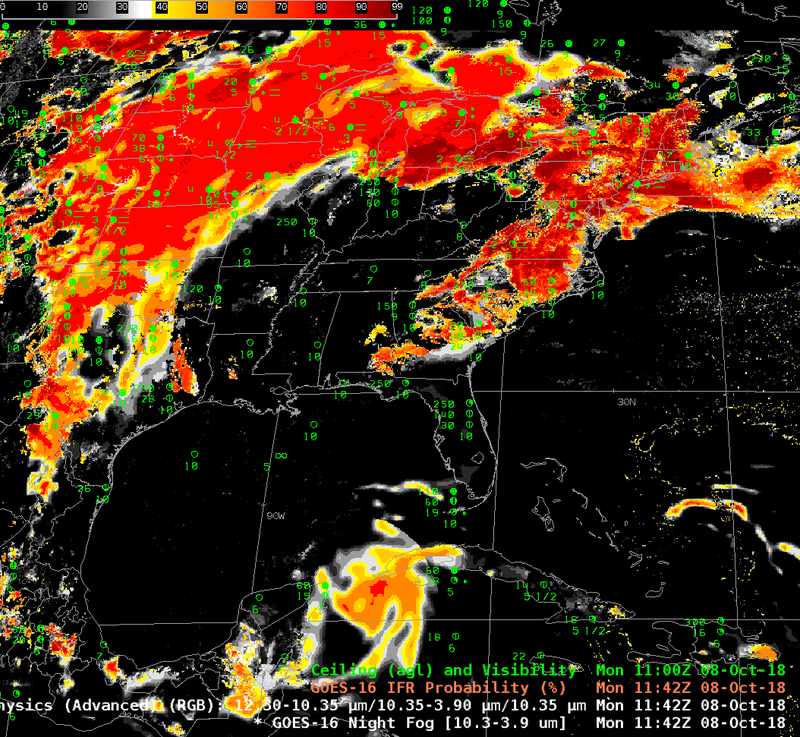 In addition, the Rapid Refresh Model data defines potential fog under the big cirrus shield over the Appalachians. Click here for the Advanced Microphyics RGB with observations of ceilings and visibility. 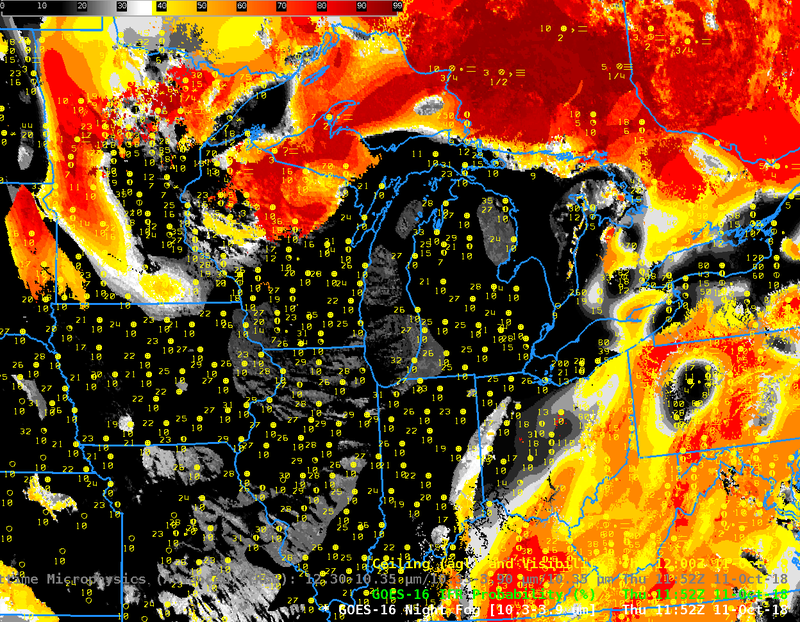 Here are the observations over the Brightness Temperature Difference. Observations plotted on top of IFR Probability are shown below. This entry was posted in Multiple Cloud Layers on October 11, 2018 by Scott Lindstrom.